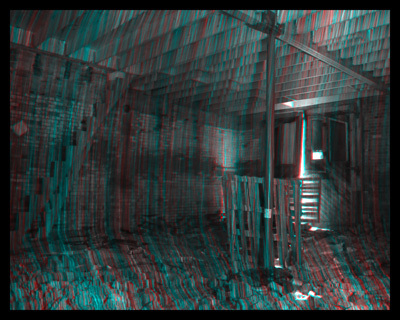 This two part series of images reflects on the potential that spaces have during transitional destruction and construction phases. Whether the imagery is of peace or war, enigmatic stories and histories are played out in macro and micro scales. An uneasy stillness becomes present with these long exposure images, as the viewer comes to terms with the imagery’s state of limbo. 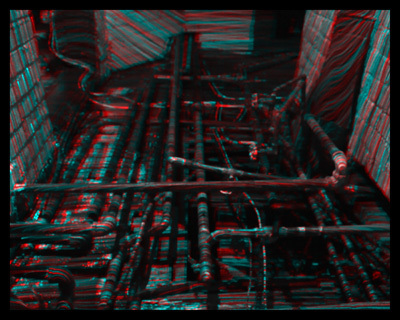 The anaglyph format presents a duality of viewing the work. 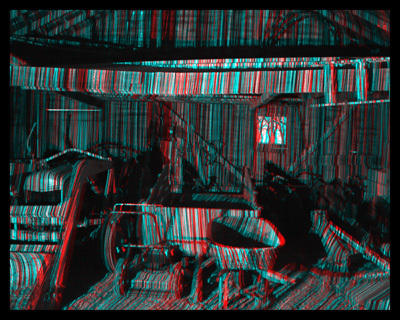 Without the three-dimensional glasses, the images are a complex jumble of lines and color. 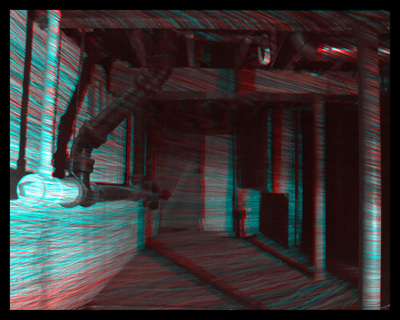 With the three-dimensional glasses, the scenes spring into vibratory depth. One modality presents a red and cyan abstracted surface, and the other provides an enveloping experience for the viewer. A digital camera is set for long exposure in each completely darkened environment. Once the camera shutter is opened, a red laser is used to illuminate the scene one line at a time. When the image has been completed being illuminated, the camera shutter is closed. The camera is moved an eye-width to either side and the entire image capturing process is repeated. Both images are taken from the camera into Photoshop. 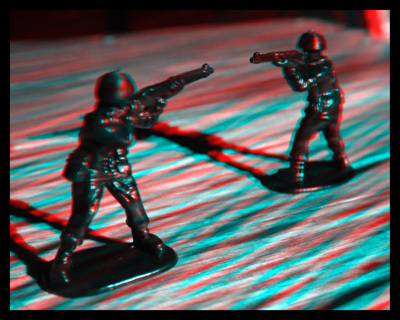 The red channel of one image is placed into the green and blue channels of the other image, creating a correct anaglyphic image, such as those used in 1950’s 3D films and comic books. Any alignment, transformations, leveling, and cropping is performed. Print. 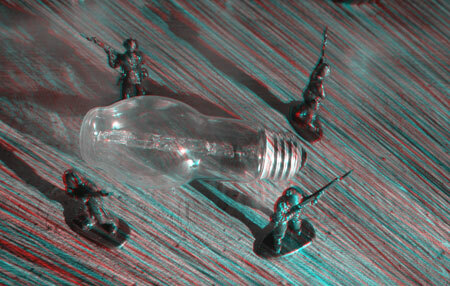 Red/cyan glasses are worn to perceive the depth from the original photos. Due to the colored filters, the left eye only sees red and the right eye only sees cyan. The difference in these color images causes the brain to interpret them as having depth. A total of 30 images were created. A sample of which is shown at the right. Originally created as slides, they are now displayed as prints. The cluttered spaces communicate both new beginnings and forgotten endings. The tracings left from the laser enhance the feeling of a slipping memory or active imagination. When the spaces are being captured by the camera in the darkness, they can exist as both. A duality that can not seen. 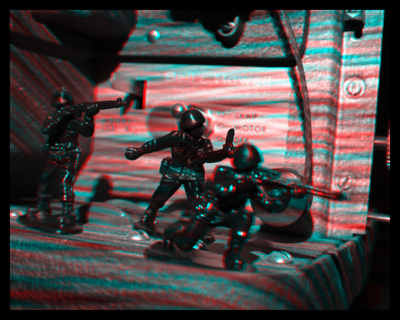 When brought into the anaglyphic format, they leap out of the two dimensional plane. Small differences in laser tracing process that are perceived by left and right eyes cause the images to shimmer and feel alive. Encapsulated by the dimensionality, we negotiate our own memories and imagination within the spaces. Who lived here, who will live here? The space becomes a transition between ending and beginning, old and new. The world police, terror action force, is seen here preventing war. These playground army men re-enact their covert human counterparts at work. 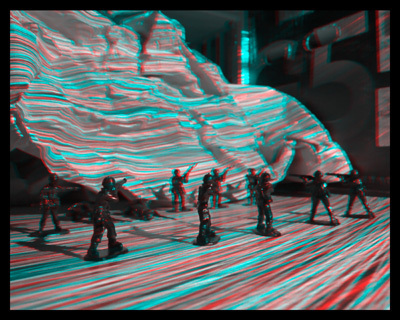 Their sculptural appearance, viewed with the anaglyph glasses, insinuate memorials of prior actions. The unnamed soldier, the unseen enemy, and fear. The laser tracings simulate tracers that are dodged in the line of duty. The patterns suggest movement, contradicting the otherwise quiet vignettes. Thanks to Caterina De Re and my parents for using their space. Special thanks to William Lindsay for his countless hours of assistance.